A reminder to parents who may have children starting school next year (Sept '12). Please complete registration form asap after mid term break, (available from the school or online) if you have not already done so. This applies, also, to children starting who already have brothers or sisters at the Gaelscoil. Registration forms are required now for ALL children starting in 2012. Go raibh maith agaibh. Caithigh na boscaí bheith réidh agus sa scoil ar an 11ú Mí na Samhna. The boxes need to be ready and brought to school by November 11th. The agenda for the next PA Meeting being held on Wed. 9th of November 2011 is now available on the Gaelscoil Website under Parents Association. Drop off at the school by November 18th!! There will be a box located just in side the main door. DVD, Box Sets, CDs, Computer Games and Consoles (Scratched discs are also accepted!). VHS video tapes, copied discs or free with newspaper. Thank you for participating in this fund-raising project for your Scoil. We will be taking photos of all of the children, grouped by their birthday month, on Tuesday 8th November from 9am. That's the first Tuesday back in school after the midterm break, and they'll be wearing their Eadai Scoile. The minutes of Monday nights Parents Association meeting are now available on the school website, under Parents Association. Please take the time to read them as they affect your scoil. Max's is holding its Gourmet Fundraiser again this year with 70% of proceeds going to the school. It is being held on Thursday 17th November and Thursday 1st December at the special price of €25 per head for a 3 course meal, parents (along with AnnMarie and Olivier) are getting together to cook, serve, and do the washing up! All to make a splendid evening for a very good cause. We do need other volunteers, so contact AnnMarie on 021-4772443 or 086-1967587 if you can volunteer for one or both evenings. We would like to encourage Parents of Junior and Senior infants in particular! Note that floor-staff volunteers would have to be available from 6pm till late. It is not necessary for just parents to support, you can be confident that, as a professional event, you can also recommend the evenings to anybody outside the school. Please see link to Menu. Beidh an múinteoir bliana dos na Naíonáin Shinsearacha, Aisling Ní Ógáin ag tosnú sa scoil amárach. Cuirimíd fáilte mór roimpi. Tá an tádh linn chomh maith go mbeidh Múinteoir Siobhán Ní Bhruachain ag fanacht sa scoil ar bhonn oideachais speisialta mar sin ní bheimíd ag fágail slán léi ach an oiread. Ba mhaith liom mo bhuíochas a gabháil léi as ucht an tréan-oibre atá déanta aici leis an rang. Tá cion an-soléir eatarthu agus táim chomh sásta go mbeidh sí leo ar feadh tamaill eile. Tá ár bhfoireann ag fás! The class teacher appointed from the interviews held last month will be starting in the school tomorrow. Aisling Ní Ógáin is her name and she will take the Senior Infant class. She is a very welcome addition to our team. We are very lucky also to be retaining Múinteoir Siobhán Ní Bhruacháin who currently teaches the class. She will be staying on in a Special Education capacity so I’m sure the class will be delighted not to be losing her. I’d like to take this opportunity to thank Múinteoir Siobhán for her wonderful work with the class. There is an obvious connection and affection between her and the class and I’m so delighted that she will be staying with them for an extended time. Our team is growing! 2. Níl na toghcháin ar siúl sa scoil mar sin beidh an scoil oscailte. The Presidential Elections are not being held in the school therefore we will be open as usual tomorrow. Tá sé de nós againn sa scoil féasta beag a bheith ag na ranganna éagsúla ar lá laethanta saoire an bhriseadh mean téarma. Beidh cead ag na páistí teacht ar scoil gléasta suas d’oíche shamhna. Táim ag iarraidh oraibh €2 a thabhairt dóibh do mhuintir UNICEF. Beimíd ag glacadh ghriangraf dos na páistí gléasta agus á sheoladh chuchu. Anuirigh bhuaigh ár ngriangraf agus úsáideann ÚNICEF griangraf dár bpáistí ina bhfeachtas fógraíochta. Téir go Unicef.ie chun féachaint air más maith! Ba mhaith liom lá gan éide scoile a dhéanamh ar a son arís i mbliana. Beidh cead ag na páistí 2 rudaí milis a thabhairt leo chomh maith – níl cead guma cogainte ná deochanna spraoi a thógaint isteach le bhur dtola áfach. Críochnóidh na páistí ag an gnátham. It has become a tradition in the school that the children have a small party on the day of the mid term break (or Halloween holidays). The children may wear their Halloween costumes to school and we will have a halloween parade around the school. I’m asking you to send in €2 per child so we can make a donation to UNICEF. We will take a group photo of the children in their costumes and send it on the UNICEF. Last year ours was the winning photograph and it is currently being used in their advertising material. Go to UNICEF.ie if you’d like to have alook, it’s undert the non-uniform day heading. The children may bring in 2 treats to have on the day –no chewing gum or fizzy drinks though please! The children will finish up at the usual times. Ár mhórbhuíochas leo uilig. Maybe they would like to put their names forward again?! They are more than welcome to do so! A Board of Management requires 2 parent’s representatives to sit on the board, one mother and one father. The board meets 4-5 times a year and various aspects of school progress / life are discussed at the meetings. These meetings are conducted through the medium of Irish so it is essential that the parent’s representatives (and all other members) have a good understanding and working knowledge of Gaeilge. If you feel that you are a suitable candidate and are willing to devote the time required to the board I would like to invite you to nominate yourself by coming to me before 2.30pm on Wednesday 9th November. I will compile 2 panels of nominees – one panel of mothers and one of fathers. We will have a meeting in the school on Wednesday 9th November at 7.30pm where people will be invited to elect the parent’s representatives for the Board from the list of nominees. All are welcome to attend. If there is more that one nomination per role a secret ballot shall be held and parents may vote for those candidates. Where only one mother or one father has been nominated those parents shall be deemed elected. Voting returns from the ballot may be retained for the purposes of co-option to fill vacancies occurring during the life of the board. Beidh Múinteoir Ciara agus Múinteoir Siobhán ag cuir tús le treenail peile tráthnóna amárach 25 DF 2011 tar éis scoil. Leanfaidh sé ar aghaidh ar feadh uair a chloig agus beidh ar na tuismitheoirí na páistí a bhailiú ar 3.30pm. Tá sé seo ar fáil do Rang a 2 agus Rang a 3 amháin. (Cailíní agus Buachaillí san áireamh) Níl aon brú ar aon páiste páirt a ghlacadh ach a bheith eolasach go bhfuil sé ar fáil. Tóg éide spoirt agus bróga reatha i mála breise. Athróidh siad tar éis am scoile. Go dtí san. Múinteoir Ciara and Múinteoir Siobhán will be starting football training tomorrow afternoon 25th Oct 2011 after school. It will be for an hour and the parents will have to collect the children at 3.30pm. This is for 2nd and 3rd Class only. (girls and boys included) There is no pressure on any child to take part but as long as you know that it’s available. Bring sports clothes and runners in a spare bag. They will change after school. 2.0: Communication how we should, when we should etc. 7.0: Select a date and time for next PA Meeting. Guímid gach rath ar Múinteoir Dara Ní Shúilleabháin atá ag pósadh amárach! Go dtuga Dia saol fada sona di agus dá fear chéile nua. 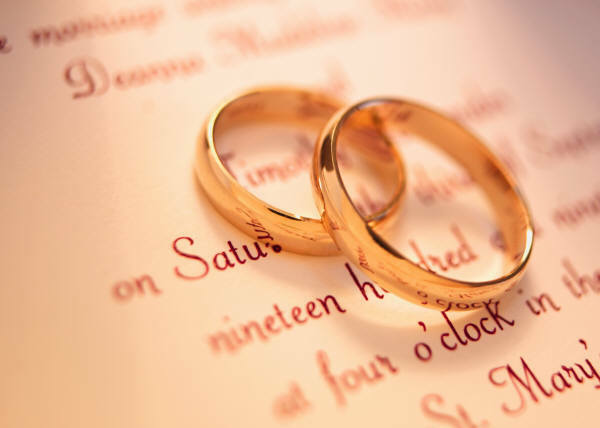 We wish the very best to Múinteoir Dara Ní Shúilleabháin who is getting married tomorrow! May God bless her and her new husband with a long happy life. Tá léinte rugbaí samplacha tagtha go dtí an siopa Young’s sa chathair. Táimíd sásta rith leis na cinn atá tar éis teacht. Tá samplaí dos na tóiseanna sa siopa faoi láithir agus is féidir libh dul isteach ann chun na tóisesanna éagsúla a thriallt. Munar féidir leat dul isteach sa siopa idir seo agus an Déardaoin seo chugainn beidh duine ón siopa ag teacht anseo ar an gCéadaoin idir 9 agus 10 chun seans a thabhairt daoibh na léinte a thriallt ar do pháiste. Beidh ordú ag dul isteach ar an Déardaoin an 27ú. Tá brón orthu mar gheall ar an moill ach b’fiú fanacht go dtí go rabhamar go hiomlán sásta leis. Beidh sé go hiontach nuair atá gach cuid den éide scoile socraithe! Samples of the correct rugby shirts have arrived in Young’s Uniform shop on Oliver Plunkett Street in Cork city. The shop is happy to proceed with these as the shape and sizes have been corrected. If you’re in the city, you may go to the shop to try on and order the rugby shirt before Thursday the 27th October. Alternatively someone from Young’s will be coming to the school next Wed (26th) morning between 9-10 with the shirts for you to try on and order. The order will be put in on Thursday and the shirts should be back within 2 weeks. The shop apologises about the delay but we were as well to wait until we were satisfied with the shirts. It’ll be great when the whole uniform is sorted! Tá na billí leabhar imithe abhaile sna málaí scoile inniu. The books bills are gone home in the schoolbags today. The Gael Scoil needs as many parents to attend as possible and it allows you to play an active role in your Scoil. Communication how we should, when we should etc. Select a date and venue for the next social event. Please make a HUGE effort to attend your Scoil Needs you! Fógra do Cruinniú Coiste na dTuismitheoirí. Tá an méid agus is féidir tuismitheoirí ag teastáil uainn ag an gcruinniú. Tudann sé seans duit ról níos gníomhaí a bhaint amach in oideachas do pháiste. · Rolla chun tinreamh a choimead agus nóiméadaí le thógaint. · Cur i láithir an Bhoird agus ról Coiste na dtuistí a soiléiriú. · Tiomsóir airgid, féasta Nollag do pháistí, san ionad thuas (The White Lady) a phlé. · Cumarsáid – caithin agus conas is coir dúinn é a dhéanamh. · Imréitiú na nGardaí do thuismitheoirí don smaoineamh féitheoireachta ag an scoil. Le bhur dtola deanaigí bhur ndícheall teacht go dtí an gcruinniú. Tá tú riachtanach don scoil! An litir deirneach! / End to notes going home! Teastaíonn uainn deireadh a cur leis na nótaí go léir ag dul abhaile mar sin, ar son seachtain na hathchúrsáile, seo an nóta deirneach páipéir a rachaidh abhaile! As seo amach rachaidh gach fógra mar ríomhphost agus ar an suíomh idirlíne www.gaelscoilchionntsaile.ie . Téir go Hilda má tá fadhb leis an idirlíon agat. Má tá seoladh baile nó Uimhir teangbháile nua agat cuir Hilda ar an eolas led’ thoil. We want to put an end to all the notes going home so, in aid of recycling week, this is the last paper note going home! From now on every notice will go as an email and will be available on the internet. www.gaelscoilchionntsaile.ie . Go to Hilda if you have a problem with email / internet. If you have a new home address or contact number, please let Hilda know. Éide scoile spoirt amárach (14/10/2011) don gCorp Oideachais. Ní raibh seans inniú. Sports clothes tomorrow (14/10/2011) for PE. We were unable to use yard for PE today due to work on buildings. Please find attached a poster from the parent support group Autism West Cork which we appreciate you circulating. Cuireadh ar an eolas mé go raibh cás míoltóga ghruaige sa scoil. Scrúdaigh gruaig do pháiste anocht agus cuir an leigheas cuí air más gá. Ní hé an chéad uair i mbliana ach an oiread. Tá páistí áirithe á fáilt arís agus arís. Iarraim oraibh a bheith an-díograiseach faoi gruaig do pháiste a sheiceáil agus cur an leigheas cuí air más gá. Téir go dtí www.onceaweektakeapeek.com (Once a Week take a Peek) muna bhfuil tú cinnte faoi cad atá á lorg. Is gá deireadh a cur leis an bhfadhb seo anois. I have been informed of a case of head lice in the school. Please check your child’s hair tonight and treat it if necessary. It is not the first time this year either. Certain children are getting them again and again. I ask you to be very diligent in checking your children’s hair and using the appropriate treatment if necessary. Go to www.onceaweektakeapeek.com (Once a Week take a Peek) if you are not sure what you are looking for. We need to put an end to this problem now. Bíodh ainm do linbh ar gach rud a sheolann siad isteach. Go raibh maith agaibh. Have the child’s name on everything you send in. Thank you. The Parent's Association AGM will be held in the Gaelscoil on Tuesday October 11th 2011at 8.30 pm. We would like to encourage all parents to attend as we hope the night will be a social affair where you can meet the other parents. Beidh buaiteoiri cluiche ceannais an chontae ag teacht chun na scoile amarach! Eide spoirt ar gach einne & ta cead aon eide Chionn tSaile a chaitheamh chomh maith ma ta siad agaibh. Cionn tSaile Abu! The winning Kinsale team from today's match will be coming to the school tomorrow 10th Oct 2011 with the cup! The children should wear their sports clothes anyway but may alternatively wear any Kinsale GAA jerseys/gear that they have to welcome the team. Up Kinsale! Cluiche ceannais peile idirmheánach idir Cionn tSáile agus Caisleáin an Bhéaraigh ar siúl i bPáirc Uí Rinn ar an Domhnach ag 2.00. Páistí faoi 16 saor in aisce. Intermediate Football Final will be on at 2.00 pm in Páirc Uí Rinn in the city on Sunday. Kinsale v Castletownbere. Free entry for under 16s! I am sorry this is reaching you with such short notice. I contacted the school just before the summer holidays trying to arrange a time to bring a judge to look at your school garden for transition town Kinsale's community garden awards that we hold each year. I had heard so much from Hilda about the enthusiasm for the garden so I felt it would be a shame to leave you out just because we didn't make it round to see the garden before the end of term. The idea of the awards is to reward and celebrate those involved in community or shared food gardens in the Kinsale area. We definitely feel that this includes you so we would be very pleased if a representative from the school was able to come to the award ceremony this weekend to collect an award for your efforts. There will also be prizes for everyone. The awards will be given at: 2pm, Sunday 9th October, Temperance Hall Kinsale. Te awards are being held in conjunction with our annual, 'Autumn Food Fest' so there will be lots of other entertainment throughout the day. Chun tacaíocht a thabhairt don club peile áitiúl sa chluiche craoibhe ag an deireadh seachtaine beidh cead ag na páistí a n-éide spoirt a chaitheamh ar an Aoine in ionad amárach. Éide Spóirt ar an Aoine in ionad amárach! To show our support for the local football club in the final at the weekend the children can wear their sports clothes on Friday instead of tomorrow. Sports clothes on Friday instead of tomorrow! A thuismitheoirí, a chairde,Ba mhaith liom cuireadh a thabhairt daoibh teacht suas chun na scoile tráthnóna Dé Céadaoin 5ú Deireadh Fómhair ‘11 ar a 6 a chlog. Labhróimíd libh faoi cad a bheidh ar siúl ag do leanbh sa chéad bhliain sa Ghaelscoil. Beimíd lán-sásta aon ceisteanna atá agaibh a fhreagairt ar an oíche chomh maith. Ag súil le bualadh libh ar an oíche. I would like to invite you to come up to the school on Wednesday afternoon the 5th October at 6 o’ clock. We will talk to you about what your child will be doing in the first year of the Gaelscoil. We will be very happy to answer any questions that you have on the night also. Looking forward to meeting you then. Go to www.gaelscoilchionntsaile.ie to register, if you haven’t already done so.